Jose Cortes is a name well known to anyone who respects the Mother of God. 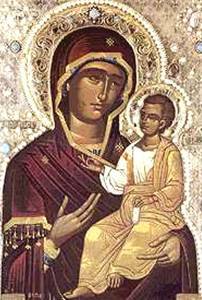 In 1982, a young, unknown icon painter was granted a wonderful icon of the Theotokos. Could he ever assume that he is the chosen one, and his life will change forever in the near future? This became a grand puzzle of destiny, with the life and the deed of Jose, the keeper of the "greatest miracle of the 20th century". 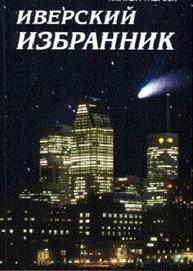 The Iveron Montreal Myrrh-streaming Icon of the Mother of God ("Portaitissa") is the main theme of Larisa Gumerov’s book, "The Iveron Chosen One" (in Russian). How does a Spanish Catholic become the keeper of an Orthodox shrine? Why, being a monk, did he not spend his life in a monastery? Instead, he chose a life of travel, encountering bizarre events of human lives. How can it occur that while travelling around the world and meeting with thousands of people, Jose has never visited Russia, which he loved from his childhood and to which he aspired to visit all his life? What was told to mankind by the sky’s guest – the Hale-Bopp’s comet of the year 1997? What happened to him in Athens in 1997, and where is his Icon now? These and many other questions are answered in a small, but lucent and deep book. If you think about the mystery of the Universe, about the past and the future, romance and poetry, then this book is for you. Reading it, you will feel how close a miracle it is to us, and how beautiful the creation of man is. You again will find your hero. Not a fictional one, not a superman, but a real hero. You will become acquainted with the new poems of Larisa Gumerov, which are a continuation of her lyrical cycle on Jose Cortes. A fine artistic design meritoriously adorns the book. The book is appealing with high quality polygraphs and features vividly-colored illustrations. The volume of the book is 72 pages. It is issued by a limited edition, which is mostly aimed for distribution in Russia and it might seem as if to be a bibliographic rarity. If you are interested in translating the book to another language and/or distributing or publishing it, please contact Larisa Gumerov lgunerov@yahoo.com. Jose Cortes was born in Valparaiso, Chile, in 1940, May 13. His mother, seniora Maria Clementina del Carmen Cortes-Fernandez, belonged to the highest level of Spanish aristocracy, which was represented with Royals, Catholic Cardinals, national heroes and the most famous people inside of this ancient brand. The real historic leader of this very old family was Fernando Cortes, who conquered America in the 15th Century. Jose’s father was senior Jose del Transito Munoz - Johnson. He was a sailor originally from England. English was a native language for Jose-junior since his childhood. Jose started to paint very early. His grandmother Maria Johnson was a great painter-aquarellist, so he was a third generation painter. In 1954, Jose mysteriously turned to the Russian Orthodoxy and stood by it all of his life. He passed high school and the Art Academy in Santiago and became a painter and an art teacher. In 1973 he left Chile and his own family to become a Canadian citizen. 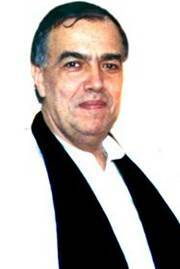 He studiously studied the arts, icons and French, and went to Montreal University in the Theosophy Division in 1979. Jose Cortes became an author of fundamental research in Apostolic History and earned a diploma to become the Professor of Theology, after he described Apostil Paul’s life in detail. He also painted unique and gorgeous icons and had great success in this skill too. Jose’s mentor was Nicholai Shcelehoff, a world famous Russian icon painter. In October 1982, Jose Cortes, as a pilgrim on the Holy Mount, suddenly became a keeper of the holy and charming Icon of the Mother of God, which started to stream with myrrh soon after. His life had drastically changed after this event, which happened in Montreal on November 24, 1982. For 15 years Jose Cortes was traveling around the world to serve the people and bring them the Icon. Bring then the Hope, Miracle, Beauties and Joy. He crossed all continents with the heavenly scented Christian treasure. Mother Mary gave Her miracles and mercy for all believers. Jose Cortes was chosen by Her to provide the unique international mission for all people in the world. He came in the Name of God. In 1993 Jose Cortes became a monk on the Holy Mount prepared for the last fight with the antichrist. As a Chosen One, Jose accepted the martyr’s crown October 31, 1997. It took place in the Grand hotel, Athens, Greece. He was 57 years old. His grave, according to his own will, is located in Jordanville, N.Y., U.S.A. The third Anniversary of the deed. Published in the “Greater Washington” magazine. October 1, 2000. Because of his life and death, through all of his heroic acts, through his courage and passion – the new Millennium finally came! Heir of an ancient Spanish generation, he converted to Orthodoxy and was subjugated to unknown spaces. Certainly, his mission can be called an international one, since it touched many countries and millions of people. "Let them all grow in Spirit and become saint men and saint women," – with this request he appealed every day to the Lady, who chose him for the great mission. The unique icon painter was also the descendant of the Corteses, the knights and conquerors of America. But Jose was definitely not like them and had different fiches in his character: spiritual sensitivity, true gentleness, compassion and a huge love to all people. And, above of all this, unbending fortitude: a will which seems to be totally forgotten by contemporary mankind. He went by his way and did not know how to lose or retreat. 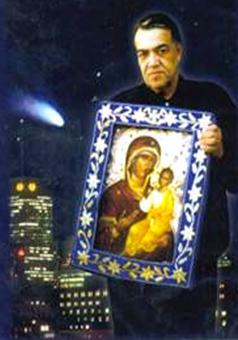 For 15 years Jose Cortes served faithfully to a miracle, being the only guardian of a marvelous Icon of the Mother of God, He got it miraculously acquired in the Holy Mount, Greece, in 1982. He traveled across all the continents with the myrrh-streaming and fragrant shrine on his chest, helping people in their daily living problems. Mother Mary called the world to penitence, while saving and protecting them from evil. Entrusted in the only and most reliable hands, the mercy of Christ and the Mother of God visited again our sinful earth. Jose became a father-in-God of a whole new generation of young people who rose near his Icon. He had his own 58 spiritual sons and daughters. Attendants of the enemy of God were hunting him all of his life. On the night of October 31, 1997, in Athens, our hero left us forever. Jose Cortes became a true Christian martyr. This satanic action was preceded by cruel persecution, slander, and a sequence of cheating and betrayals. The event outraged the world and filled it with pain and sorrow. It might seem to be nonsense, but what happened was not accidental. Being the chosen one, Jose was preparing for this final battle from his childhood. And he still held victory over the world, along with the lives he has touched. Like our Lord Jesus before, he changed the world and he won the world! His body is found in eternal rest in the holy land of Jordanville, located in upstate New York, USA. Life continues and goes on to celebrate. The new millennium came into the fair hands of Jose, as all of his restless prayers for us continue to save us, and give us an opportunity to grow in the Spirit. He performed his unique Duty honestly and until the very end. Let the most sacred dream of his life come true! Now it is the time for our turn to act. All who want to participate in the celebration of the 5th Death-victory Anniversary of Jose Cortes, and to give their love and appreciation, are invited to visit Jordanville, N.Y. 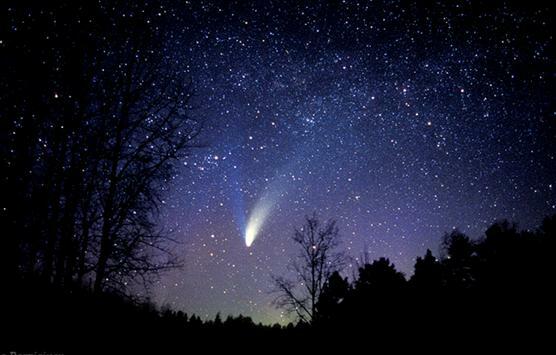 The Hale-Bopp comet. Spring 1997.